A GRIP ON SPORTS • If this is the final day of Gonzaga basketball in the 2018-19 season, at least it will end in a fitting manner. No. 1 vs. No. 1. In one way of measuring, at least. Read on. • The Zags are the nation’s best offensive team. They have been considered such for the entire season, sometimes hitting historic marks as judged by the most complete analytical measures available. Texas Tech is the nation’s best defensive team. Has been rated that way for much of the season’s second half. And it’s not because the Red Raiders from West Texas take the air out of the ball, either. They just get down in a stance and fight every possession. It’s a contrast, all right, but one with a bit of an edge. Yes, the Red Raiders are great defensively. But they are only so-so on the offensive end. Of the eight teams still alive in the NCAA Tournament, Texas Tech is last in offensive efficiency, according to Ken Pomeroy’s system (the best one out there). Six of the schools left are in the top seven of Pomeroy’s most-efficient offensive teams. Kentucky is 12th. And then you have to scroll down to find TTU. Yep, there it is. Thirty-first. A true outlier among the elite. The defensive numbers are a more spread out among the eight remaining schools. Texas Tech is first. Virginia is third. Duke, Kentucky and Michigan State are clumped from seven to nine. Gonzaga is 12th. Purdue is 28th and Auburn is 43rd. In other words, you don’t have to spectacular on the defensive end to survive and advance, but you better be able to score. Which brings us to this afternoon’s matchup in Anaheim. Can the Zags’ defense lock down Texas Tech enough for their offense to lock in? As the Bulldogs’ two decades of West Coast dominance has progressed, their chances of winning a national title has done the same. Mainly because they have gotten better and better at getting stops. Mark Few’s teams have always been able to score. It’s a hallmark of the program. But defending at an elite level? That’s a more recent accomplishment. In 2006, when GU went 29-4 and made the Sweet Sixteen, the Zags were No. 1 in the nation in offense – and 174th in defense. In 2015, when GU began its series of Elite Eight runs (three in the past five years), it finished fifth in offensive efficiency and 16th on the defensive side. In the NCAA Finals year of 2017? The Zags were 16th in offense and first in defense. 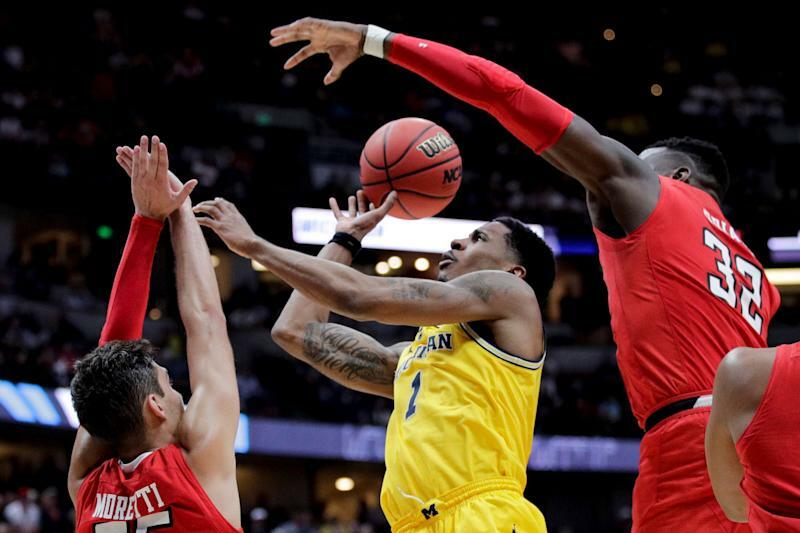 If the Bulldogs are going to move on to the Final Four this afternoon, their defense will have to be solid enough to trade blows with the Red Raiders for 40 minutes. If it is, then at some point the offense will kick in. It might only be for a few minutes, keying an 11-2 run or something. But in a game with two teams capable of stringing together four or five stops, it should be enough to ensure a ticket to Minneapolis. Gonzaga: Before you head out for whatever you have planned this Saturday morning, catch up with the Jim Meehan-led coverage from Anaheim. Jim has a preview of today’s game, the key matchup, a story on a TTU player that’s played Gonzaga before, a quick hit on Killian Tillie’s shoe problems as well on some records set by two Zags. … John Blanchette has his column about the pressure of the Elite Eight. … Theo Lawson has a story on “fan” Johnathan Williams and another on Tillie and a Texas Tech player. … Justin Reed looks at Texas Tech’s key player, Jarrett Culver. … Tyler Tjomsland has a photo report from Friday. … Larry Weir and Sam Adams discussed the weekend in the latest Press Box pod. … Donny Daniels made the right move a few years back. WSU: CJ Elleby hasn’t been in Pullman all that long, but with the coach that recruited him, Ernie Kent, no longer there, neither may be Elleby. The freshman do-everything player is going to explore his professional options this spring and summer, though he says he won’t be signing an agent just yet. Theo has more in this story. … The baseball team opened a home series against third-ranked Stanford with a loss. … Elsewhere in the Pac-12, California moved quickly to hire a new basketball coach, reaching agreement with former Nevada and Georgia coach Mark Fox. Did the Bears move too quickly? … Oregon, playing basically in a home game, moved on to the Elite Eight in the NCAA women’s tournament, while Oregon State couldn’t score enough to get past Louisville. The Pac-12’s nice run ended for UCLA and Arizona State as well. … There is football news from Washington, Colorado and Arizona. Chiefs: Spokane is back in town tonight, needing just one win in the final three games to eliminate Portland from the WHL playoffs. Kevin Dudley has a preview of tonight’s game. Mariners: For some reason I couldn’t turn the television off last night, even though it seemed inevitable the M’s bullpen would fall apart and blow what was a five-run lead against the Red Sox. It did. Boston rode a three-run, ninth-inning, pinch-hit Mitch Moreland home run to a 7-6 victory. Gene Warnick has his thoughts in the latest Out of Right Field column. … Seattle picked up a backup catcher from the Giants and he was in uniform last night. Sounders: The first rivalry game of the MLS season is upon us, as Seattle meets Vancouver.